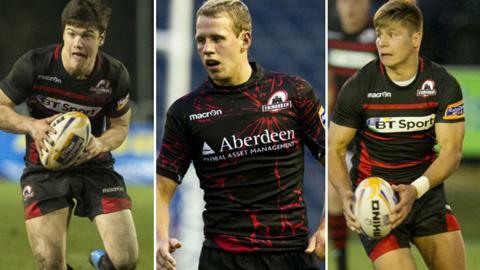 Edinburgh fly-half trio Harry Leonard, Gregor Hunter and Piers Francis are leaving the club in the summer. Leonard joined in 2011 as an elite development player and started 25 of his 37 appearances in the pivot position. The 21-year-old is heading to English Championship side Leeds Carnegie. Edinburgh coach Alan Solomons said: "This is the right decision for Harry at this stage in his career as he will be guaranteed to start at stand-off." Leonard, a former Scotland under-20 captain, insists the time is right for a new challenge. "It will be a good opportunity for me to get more consistent game time," he said. "The ambition and aspirations of Leeds have impressed me and it is a young team I am looking forward to being part of." Hunter, who also came through the Scotland age-grade ranks, made 16 appearances for Edinburgh, but the 22-year-old was ruled out for the whole of this season after injuring his knee playing for Hawick in August. Englishman Francis, 23, joined the club from Waikato last season but suffered an injury in pre-season and has only recently returned to training. "It's been a tough year for Gregor and Piers," added Solomons. "They're both great blokes but unfortunately got injured early in the season and have been unable to play during my time at the club. "Everyone at the club wishes all three of these players the very best." Meanwhile, Edinburgh prop Ewan McQuillin, along with Glasgow Warriors back-row forward Adam Ashe, are the latest young Scottish players to win a scholarship to play in New Zealand. The 22-year-old McQuillin and Ashe, who is two eyars younger, follow in the footsteps of present Scotland internationals John Barclay, Grant Gilchrist and Jonny Gray as recipients of the John Macphail Scholarship. They will spend 15 weeks in Christchurch, New Zealand playing for local clubs and being coached at the Canterbury RFU International High Performance Unit.